The Clark Community Mental Health Center is a private 501c3, not for profit corporation, organized for the purpose of providing mental health and substance abuse services to residents of Barry, Dade and Lawrence Counties. 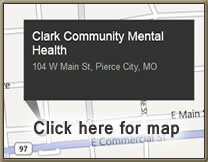 Clark Community Mental Health Center has proudly delivered services in Barry, Dade and Lawrence Counties since 1971. This organization is governed by a board of directors who are members of the community. The mailing address and phone number of the Administrative Office of the Clark Community Mental Health Center are Post Office Box 100, Pierce City, Missouri 65723 and 476-1000, respectively. Our organization includes a fully qualified staff of professionals with a wide variety of clinical skills including: psychologists, social workers, substance abuse counselors, psychiatrists, trained family intervention specialist, community support workers and crisis workers.